And he does it all with six strings, an insistent, understated groove and a sly wink — letting you know that we may all enter and leave this world alone, but that don’t mean we can’t have a good time while we’re here. Hundred Dollar Valentine, Smither’s 12th studio disc, due out June 19, 2012 on Signature Sounds, sports the unmistakable sound he’s made his trademark: fingerpicked acoustic guitar and evocative sonic textures meshed with spare, brilliant songs, delivered in a bone-wise, hard-won voice. It’s easy to see that Smither’s primary touchstone is acoustic blues, once describing his guitar style as “one third Lightnin’ Hopkins, one-third Mississippi John Hurt and one-third me.” While “blues” can evoke images of beer-sodden bar bands cranking out three sets a night wondering why one’s baby left them, Smither reaches back to the primordial longing and infinite loneliness held within the form. Sure, the album kicks off with the deceptively jaunty title track, whose good-time, ricky-tick shuffle masks the singer’s walking the creaky floorboards of doubt. But the cosmic blues come to the fore on the next cut: “On the Edge” is part conversation, part confessional and part affirmation. This is when you start to realize what extraordinary artistry — what seamless meshing of sound, subject and delivery — is going on here. The recording sessions came together during early 2012 at Signature Studios in Pomfret, Connecticut. Stopping by were the nexus of two of Boston’s most distinctive and influential acts of the recent era — Treat Her Right’s (later Morphine) drummer Billy Conway and Jimmy Fitting on harmonica, and Goodrich’s ex-Groovasaurus bandmates Anita Suhanin (vocals) and violinist Ian Kennedy (Page/Plant, Lemonheads, Juliana Hatfield, Peter Wolf, Susan Tedeschi). While it is no surprise that several of his songs have become virtual standards, it is ironic that the assuredly masculine Smither has found favor almost exclusively with female singers: “Love You (Me) Like a Man” has been recorded countless times, with the best known versions by Bonnie Raitt and Diana Krall, “Slow Surprise” by Emmylou Harris and “I Feel the Same” by Raitt, Candi Staton and Esther Phillips among others. “We chose ‘I Feel the Same’ because of its conciseness. I’ve been told it’s a good example of less is more,” says Smither. Indeed, in three spare verses, “I Feel the Same” is one of the most hauntingly evocative modern blues ever written. “All that nothin’ causes all that pain,” marvels the singer, as he surveys the desolate landscape of heartbreak before him. On Hundred Dollar Valentine, Chris Smither makes music that simultaneously breaks and fortifies one’s heart. It’s music that acknowledges that even as we are together, we are alone. This is music that stares into that absolute abyss and does not lie. This is music that locks its gaze with life and death and does not look away. 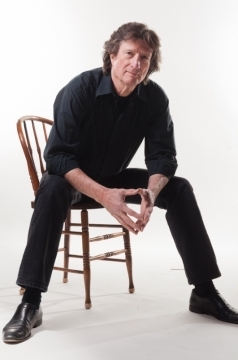 On Hundred Dollar Valentine, Chris Smither sings the cosmic blues.